Take to the skies for the Rebels. 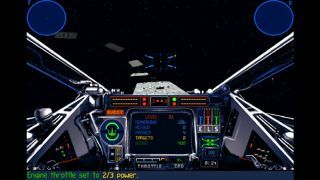 For any Star Wars fan with a home computer in the early 90s, blasting X-Wings and TIE Fighters out of a heavily pixelated space environment was a must. Now a bunch of those classic games have arrived on Steam so you can relive the experience all over again. The X-Wing Special Edition offering that just went live includes both the 1993 MS-DOS version and the 1998 Windows release. The Imperial Pursuit and B-Wing expansions are included too, so this is a comprehensive package. If you're more of an Empire kind of guy or gal then the TIE Fighter Special Edition also features both DOS and Windows editions (1994 and 1998 respectively) as well as the Defender of the Empire expansion pack. Also in the mix on Steam are X-Wing vs. TIE Fighter and X-Wing Alliance, and you can pick up all the new titles in a bundle if you want. System requirements aren't the most demanding but having a joystick or gamepad is a good idea. Alternative gaming platform GOG has had these classics since the start of the year and is continuing to push out others: Star Wars: Rebel Assault I & II and Star Wars: Jedi Knight - Jedi Academy have been recently added. That's plenty of retro gaming action to keep you going until The Force Awakens arrives in December. You can game away as if it's 1995 and pretend the prequels never even happened.